Toyota's petrol and electric hybrid model, the Prius, is more than just a car - it is a phenomenon. And not only because it has just been voted car of the year 2005 in Europe, on top of a similar award in the USA early this year. The car's surprise success has sparked a revolution in the car industry that is about to change forever the way the world's automotive sector operates. "In 20 or 40 years" all the automotive group's cars will be hybrids, the man in charge of Toyota's research and development, design and product development, Kazuo Okatmoto, told the car industry magazine Automotive News Europe. "And it won't just be Toyota. All makers will have hybrids," he said. But these are early days. With just 8,500 sold in Europe this year, the Prius's lofty reputation has not come about as a result of it being a best-selling model. Rather, it has risen to the pinnacle largely thanks to endorsements from the Hollywood glitterati and their penchant for political correctness. 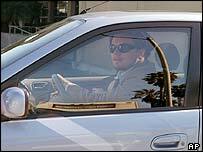 High profile Prius drivers such as Leonardo di Caprio, Billy Crystal, Harrison Ford and Susan Sarandon have done a world of good for hybrid cars; these days everyone who is anyone want one. And yet, total global Prius sales reached just 43,000 last year. Hollywood's enormous impact on the Prius's fortunes surprised even Toyota, which has simply been unable to deliver in sufficient numbers. So in a rearguard action, it dramatically boosted its capacity to support the sale of 130,000 Prius next year, just over a tenth of them in Europe. Further production facilities are being prepared outside Japan, including in China where Prius production will start next year. And the company might even start producing the Prius in California, where Hummer-driving Governor Arnold Schwarzenegger has been prompted to swear his allegiance. Last Friday, Mr Schwarzenegger held talks with Toyota President Fujio Cho about producing Prius at the car maker's Fremont plant. But if the Prius' success caught Toyota unawares, the situation was much worse for its competitors, some which have no hybrid offering at all. Several are now desperately scrambling to catch up, with Ford and Nissan both having entered into licensing agreements that allow them to use Toyota's hybrid technology. 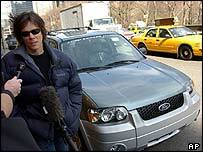 "We only have one planet," declared actor Kevin Bacon after having driven the car last April. "We have to protect this one." GM, which initially had little faith in the hybrid solution, arrived late at the party, though. In Europe, meanwhile, the French car makers' stop-and-go technology has some way to catch up with Toyota. Toyota's own efforts are also impressive: earlier this year, the car maker's luxury subsidiary Lexus unveiled its RX400h SUV and soon all Toyotas will come with hybrid engine options. The trend is clear: the supply of hybrid cars is set to rise very fast indeed. Do you own a hybrid car? Would you consider owning one? Back in June, after testing a Prius, I immediately realized that I must have one and correspondingly purchased it. All advertisements and reports seem to conceal one of the most important features of the Prius: it is really fun to drive one. I ordered one two months ago, and I'm still not expecting delivery for at least another three months. Hopefully this publicity will prompt them to divert a little more of their production Europe's way, otherwise our waiting list might get totally out of hand. When will people realise that the environmental cost of producing a car is far greater than the nominal fuel savings that can be made in using so called green cars? Producing less cars is what would make us "green". And let's face it, there aren't many people who want that. I already decided two years ago that I wanted a hybrid - at that time what stopped me was that I couldn't find one available to transport a family with three children (only the 2-seater Honda was available at the time). The next car will definitely be one. Good for the planet, but probably even better for the economy and international politics, which I see as even more pressing priorities at present. I would consider owning one except they are more expensive than the regular fuel-powered cars! I almost got a Honda Civic Hybrid but was turned off by it when I realized it cost more than the non-hybrid version. There should be tax incentives to buy more of these cars, when the government does that I'll be waiting right outside the dealer's door to buy a hybrid! When my wife bought her Echo a few years ago, she looked very closely at the Prius. At that time it was at the peak of its dowdiness, looking like little more than an Echo with better trim. She test drove a Prius and we were both impressed by it. Still, she went with the Echo because of the lower price. However, if Toyota can bring the price of hybrid technology down a bit I am sure everyone in the market for a small efficient car will buy one. I don't ever really wish to own a car, they're expensive, come with recurring costs that can reach more than £1,000 annually and most of all pollute our planet. But I must admit these cars are bringing me closer to buying one, but for now I think I'll stay on my bicycle, as this way I can avoid all the traffic after work as well as get the exercise to boot. I own a Prius since 2001. I have managed an average of 55mpg on a mixture of city and country driving (17,000 miles) since them. 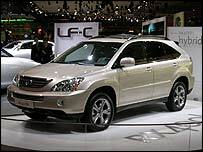 It is an excellent car to drive and the quality is everything you would expect from Toyota. The new model is even better and involves almost no compromise compared to the older model I own. Wisely the Irish government introduced a healthy rebate on VRT which is an added incentive to buy and there is no reason (apart from one of supply) not to go hybrid. The hybrid solution is very exciting from an environmental perspective. I can't wait to see Hybrid cars rolling around Britain. They are certainly going to become a good investment. We must remember however that cars cause many other problems, they kill people everyday in accidents, reduce numbers of people cycling and cause noise and visual pollution. While I welcome environmentally friendly technology, I hope it will not damage public transport and cycling initiatives or their associated safety and health benefits. Whether hybrid or not, our reliance on cars is still destroying any hope for an inhabitable planet for our children, never mind other species. To make hybrid SUVs/4x4s is a kind of sick joke - helping people con themselves that their status symbol is alright, and not an even worse planet-trasher! How can we justify our behaviour? I would consider driving a hybrid vehicle, as I believe strongly in conservation. However, I simply cannot drive one due to the small size of such vehicles. They just don't make them for large shouldered Rugby players such as myself! I drive a Honda Civic currently to cut down on emissions, but even my small car has more room than some of these SUV hybrids. I so fervently wish they would do something about the small size of these wonder cars! 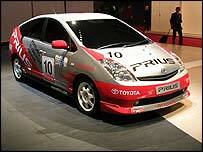 I own the original Prius Saloon model from a few years ago. A relative has the newer hatch version. Both cars are excellent both in economy -50mpg, but the electric motor gives it a hot-hatch type acceleration as well. It is good on motorways, super-long warranty; free breakdown assistance etc and never had a problem - cannot fault it, it is the best car I ever had. One amusing "danger" though - car parks - because the engine is silent pedestrians cannot hear you coming. My Prius celebrates its second birthday with me (its third year, since I bought it off the lot at the end of 2002, just before everyone else discovered how great it is). It has been a real joy to drive. An added benefit which has not been discussed to my knowledge, is that - since the engine shuts down when the car is idling - the car is quiet and actually allays stress that one carries unnoticed from the ubiquitous sound of gasoline-driven engines. We bought a Honda Civic Hybrid last year because my husband wanted a stick shift and Prius doesn't offer that option and we LOVE our hybrid car. We routinely get 48 -51 miles per gallon. We were concerned about its ability to have comparable "pick up" speed on the highway and it has not been an issue at all. The pick up is excellent, the is ride smooth. We are looking to buy another hybrid car. I have a hybrid car. It is very fuel efficient and quiet. The technology though, seems to beat even the Toyota engineers based in the UK! I have had a few problems and due to the complexity of the systems, it can only be repaired by the main dealers, and I was then shocked when the main dealers told me that even they had problems as they did not have sufficient training on the new hybrid cars! The situation will probably improve in a few years, but I think I will be selling my car and then buying a new one in a few years once it can be supported in the UK. How about producing cheap small hybrids for normal people, instead of hybrid hummers and SUV's for the Hollywood crowd? I love the idea of this new technology and the fact that it uses half the energy of a standard car - if we could manage the same throughout our energy systems, the climate change problem might well be solved. But, being adequately fit and living in London I have very little use for a car, and if there's one thing greener than a hybrid, it's no car at all!